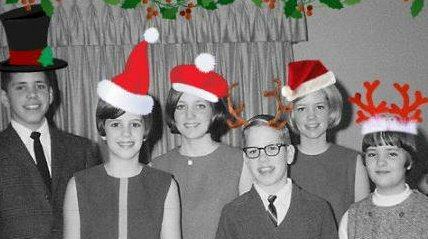 The Ghosts of Christmas… | Janet Dahl, et al. Maybe I love Christmas because I hated school as a child, and two weeks without homework or peer pressure was heaven. Maybe I love Christmas because Mom loosened her "no TV" rules to allow us to watch Andy Williams, Perry Como and the Mormon Tabernacle Choir TV Specials. Maybe I love Christmas because my Mom made countless tubs of cookies and fudge. There were so many treats that she was unaware of my pilfering. No- she knew, she just let me eat to my heart's content. I know I love Christmas music. I loved being in the choir, singing the Christmas concerts. One year I was the featured soloist at midnight Mass, charged with singing O Holy Night. I had a boil so giant on my face that my eye was swollen shut. Still, I sang. In profile from the choir loft, like the Phantom of the Shrine of the Little Flower. I love the candlelight and the decorations. I love Chicago, all gussied up. I love snuggling into home late at night with the tree lights hypnotizing and calming me. I love the smells of cinnamon and evergreen. I love cider pods for the Keurig. With a dash of rum. I love family time- seeing the kids' babies dressed in red velour and Christmas plaid. I travel back to Santa years with the boys. I celebrate the past, and I see the future in those tiny babies. Henry, Mary and Jackson- these are the gifts that count, and make my life feel overstuffed. I honor Christmas because we toll the years with Christmas pictures and memories. We recall old habits and traditions, generate new ones. We negotiate our shards of available time so we can share a room for a few hours. Or a meal. By navigating the obstacles, we tell our family that we love them. Even if we fight sometimes. We look back, look forward. And our purview includes all the people we love. Or miss. My parents drew the blueprints for my Christmas romance. Mom handled the indoors, Dad was in charge of the outside. Garland on the gutters. Check. C-7 lights, unspooled from shirt cardboard. Check. Bonus: An ice skating rink in the back yard, sprayed from the basement laundry tubs. Check. One year my Dad planted a Nativity scene, featuring all the Holy Family in 3-D glory, decoupaged onto plywood and cut out with his jigsaw. Dad mounted them on metal stakes, and lit them with a runway worthy light. The stable looked beautiful..until a week after Christmas, when we realized the stakes were frozen into the ground. Either we would host the Holy Family until the spring, or dad would liberate Mary, Joseph, Jesus and a cast of animals and visitors from their posts. It didn't look a whole lot better to have 8 spikes growing ominously from the front yard, but it satisfied Mom. I think the Nativity scene went on hiatus after that. Every Christmas, the same ritual: Dad tied our doors together so there was no peeking. He went downstairs to see if Santa came- though really to get the movie camera up and running. Down we came, captured by a 16mm camera and a light bar that looked like Bullwinkle's rack. Chaos and mirth ensued. Sometimes the vinyl purse or hat with metal spangles were misses, but they were picked with love. We would never return a gift unless it didn't fit. Many of the things I embraced from my childhood have not transferred into my married life. I am not a baker or a seamstress. Our Christmas movies are willy-nilly. We were not smart enough to tie the doors, with an occasional spoiler provided by an older brother. "I think you will get a work bench, Matt..." Sound familiar, Mike? My Christmas dinners are not memorable. Steve has never used a jigsaw to replicate Bethlehem. I don't look out for Christmas specials on TV: I even managed to avoid the Duck Dynasty holiday CD and TV celebration. I suppose I have gifted my fair share of "misses" but the boys use them in their comedy routines. Sure, I once wrapped a profane rap CD because the Best Buy guy said it was #1. That is my Christmas mythology. Like Mom, though, I DO go nuts decorating, and I constantly wait for my Christmas "moments." They are found in the late night twinkling of my tree, shared with the dogs and a glass of wine. Steve tries hard to nurture my spirit with the gift of service: in the last two days he has re-graveled the dog run, protected me from a mouse by putting down poison in the garage, and washed my car. Each of these gifts captures the essence of Christmas spirit. Early in our marriage, I asked him if he would sleep by the tree with me. He did. Years later, I installed a tree in our bedroom- quite a distraction for an insomniac, I expect. He was a good sport. Now he lets me dream away downstairs while he catches Colbert and Stewart. Our Christmas has evolved. And will continue to do so, God willing. And when our time is done, I know the glimmer and glitter is well planted and fertilized in the next generation. We cannot all be home for Christmas, or with our families. But in spirit, memories and dreams, we are together. May your days overflow with stories, songs and joys, people who love you, and smiles to be shared. Do not allow yourself to be disappointed. Put a magnifier of the joyous moments, and shrink the things that aggravate you. Bite your tongue if an unkind thought about your drunk uncle starts percolating. Switch him to grenadine and 7 up. Do a few good deeds. Tip the garbage man if you have a mountain of debris that he has to chase down or rescue from a snow bank. Wear a silly hat. Tell the choir they dominated. Spread the joy of Christmas, which is love, sweet love. If you are reading this, at this ridiculously cluttered time of year- you are an incredible light in my life. Thank you. I wish you every blessing- today, tomorrow, forever. I expect we are kindred spirits. I hope you love Christmas, too. Please join me in the coming year as I share moments big and small. Subscribe and this Janter will wing its way into your mailbox.